Scholars do agree that the Little Ice Age impacted our shared global history in myriad traceable ways. Its unpredictable temperature fluctuations and sudden freezes devastated harvests, escalated civil unrest and left thousands to starve. It may have inspired the menacingly chilly settings of Shakespeare’s “King Lear” and Charles Dickens’s “A Christmas Carol.” Darkness and clouds haunt the skies of paintings created during the period. In one French medieval manuscript (illustrated between 1115 and 1125), the knight’s skirt is slit to the hip, and his squire’s hemline stops above the knee. 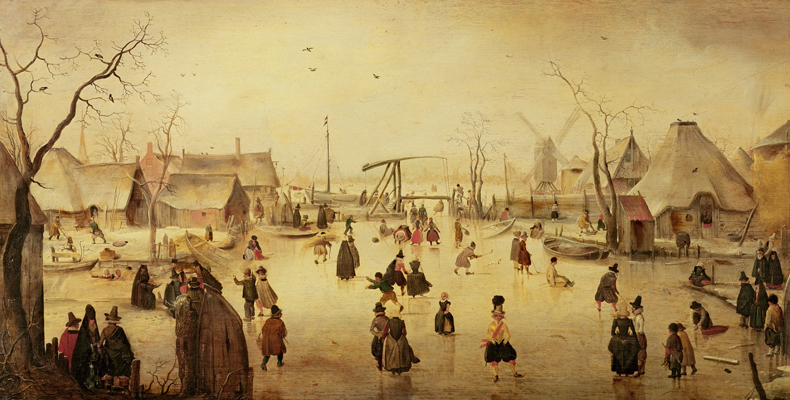 There are no capes, fur or headgear; the garments are light and loose – especially compared to what men wore 400 years later, when the Little Ice Age was in full swing. The cleric has donned a floor-length coat befitting his godly station. But it would have also been very effective against cold. Both men sport fashionable caps and undergarments. The laced collar of De Selve’s undershirt peaks above his robes, and those white slashes in de Dinteville shiny pink shirt show off his hidden layers. As with all portraits from the era, these men dressed to impress for the sitting – meaning their fanciest clothes were possibly their warmest. Several petticoats would have been required to sustain the bell shape of her skirts. If you look closely, you’ll see a thin, translucent layer of fabric that shields her exposed skin where the neckline ends. Meanwhile, a large fur mantle – at the time, an essential accessory – is draped over her arms. Yet for many, it remains a distant phenomenon, something that – beyond buying lighter, looser clothing – is easy to dismiss.